Obsessed much?? Yes, I'm still on the tote bag making machine. I need to stop, seriously! But then again, can you really have too many tote bags? Especially when you don't want to bring home any more gross plastic bags? 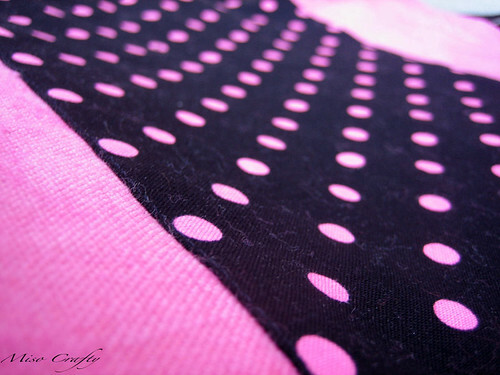 Anyways, the newest one: the Pink Polka. I had quickly sewn this during a rare lunch break that Brett was able to have at home. Normally Brett's lunch breaks happen in between students in which he has to scarf down a sandwich and maybe a banana before he has to meet his next student. Last week he was able to come home for an hour and a half and got the opportunity to actually taste his lunch! Yay for unexpected sewing time!! I used the pink canvas again. 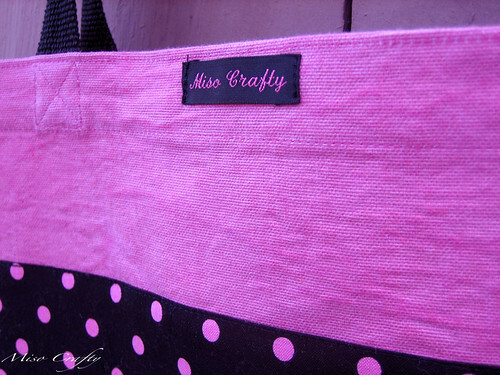 This time I used black with pink polka dots fabric for the panel. It wasn't planned, but the pink dots match the pink of the canvas perfectly! And this time around, I put my label on the outside of the tote on the front. I don't know why I did that, most likely cause the bag has a black and pink color theme to it and I thought that since the label is black and pink too that it would be ok to display it. Since I've already made 3 totes previous to this one (one of which I'm not going to make a post about until later...ooohhh...secrets! ), sewing this up went pretty darn fast. 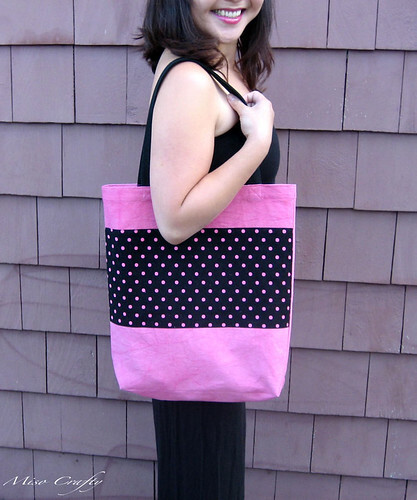 Yes, this simple style of tote is already quite the fast sew but still, I managed to pump this out within 15 minutes. Hmm...maybe that's why I like making totes as of late? Fast, easy, useful, and can all be done during the munchkin's (almost) non-existent nap time!